At Sea with the Marine Birds of the Raincoast by Caroline Fox is a passionate plea to conserve the sea bordering the coastal rainforest of Western Canada, but its narrative is a gut-wrenching, frozen-fingered, what-the-hell-were-you-thinking adventure of a young biologist aboard a sailboat on the exposed British Columbia coast. Fox joins biologists and sailors from the Raincoast Conservation Foundation to document the seabirds that frequent the topsy-turvy waters of Hecate Strait along the British Columbia coast. The book chronicles the drama of a conservation biologist in the field, set alongside the story to protect the Great Bear Rainforest—near which they sail—from trophy hunting and excessive logging. She takes on the well-worn theme of fighting the good fight against industrial giants and slow-to-act governments. This struggle gives purpose to the adventure around which Fox weaves her story with infectious enthusiasm. Fox summarizes in one chapter what is known about birds at sea on Canada’s west coast, followed by a chapter on the spring migration of massive flocks of birds pursuing herring and their eggs. Next, her writing enters the island worlds of breeding auklets, murres, puffins, gulls, and murrelets; slips into coastal estuaries during the salmon spawning runs and the arrival of seabirds from distant lands; and closes by returning to sea with her conservation message. Her prose is an impassioned exposition of a natural world few have experienced. Fox lets the reader know early on which side of the conservation versus development argument she resides. She writes of a “seemingly unstoppable decline” in marine bird biodiversity, although the precise role humans have played is not entirely clear. Set aside this quibble though, and focus on Fox’s writing. Seldom do academics pen statements such as, “From across canyons of evolutionary space, they seeped into my subconsciousness, bird by bird, and their complex, wondrous lives became wound up with mine.” I hope there will be more from her. Heroic hardship sums up what Fox and her hardy crew endured. Clinging to a slippery boat deck and spending hours in howling winds while the boat pounded over endless waves proved the power of their conviction to preserve the sea adjacent to the rainforest. Their efforts also made an important pioneering contribution to the natural history of British Columbia and to the understanding of seabirds from California to Alaska. Over 7,000 kilometers traveled and 100,000 birds of 69 species tallied is an impressive and hard-won achievement. Fox and her colleagues deserve kudos for assembling a body of information on this overlooked part of British Columbia. Perhaps even more important is how Fox’s book may instill in young scientists a sense of adventure with a purpose. 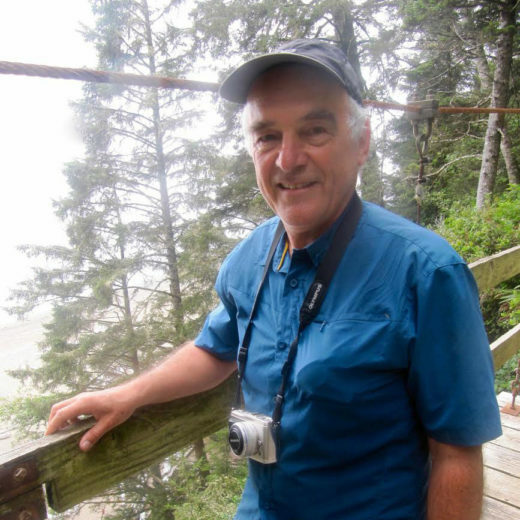 Rob Butler has conducted field research and advised governments, business, and conservation organizations about birds and conservation for over 40 years. He has written for scientific journals, monographs, newspapers, and popular magazines, and has authored two books. Cite this Article: Rob Butler “Book Review: At Sea with the Marine Birds of the Raincoast,” Hakai Magazine, Oct 20, 2016, accessed April 23rd, 2019, https://www.hakaimagazine.com/article-short/book-review-sea-marine-birds-raincoast/.